Automatic grain weighers provide a reliable, accurate and automatic method of weighing tea grain, fed from an elevator, conveyor, storage hopper or silo. Each completed weighing cycle is automatically recorded on an easily read counter. This feature combined with interlocked feed and discharge levers, renders the weigher completely full-proof and Eliminates Errors. Capacity:- 50 Kgs. Batch. Uses the principle of Stalk & Fiber extraction by means of static Electricity taking advantage of a moisture differential between the Tea & stalk. The production of Electrostatic medium by mechanical means makes the extration of fibre from the tea to enhance the electrostatic effect by heating. Electric bulbs on rollers are provided.Machine consists of 6 Nos. of 54" wide rollers, Hopper for feeding, Dimple tray fitted on a rigid, steel frame. The drive is through a crank provided with a Ball bearing using 2 HP Motor of 1440 RPM. Output per Hour - 500 Kgs of made tea. This is a self balancing machine,in M.S. construction has a modular arrangement and work on eccentric gyratory motion. This consists of upto 7 decks. S.S.Mesh can be supplied as per the user's specification. This is a compact machine & ensures perfect & faster grading,upkeeping the appearance & bloom of Teas, requiring less floor area & power with virtually no maintenance. Power : 1.5 H.P. Space, Speed, Compactness and versatility are the prime factors of 'Zenith' Vibro Sorter to replace the old conventional sorting machineries with a view of economy and efficiency. This has revolutionised the sorting system. The 'Zenith' Vibro Sorter, a self balancing machine, in M.S. Construction has a modular arrangement. This consists of upto 7 Decks and each Deck is provided with S.S.(AISI - 304) Screens of different meshes, as per the Nos. of mesh required. 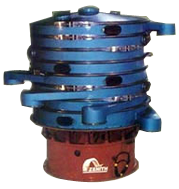 The whole assembly resting on several Heavy duty springs are securedly fixed to a heavy M.S. Circular base. The vibrating assembly is isolated by a cone mounted spring assembly. The drive consists of 1.5 HP (1.1 KW) totally enclosed heavy duty specially designed Vibrating Motor and is housed inside the chamber. The different weights at different angles are eccentrically attached on both ends of the Motor shaft. By changing the position of both the eccentric weights, the efficiency of the screening changes. The gyratory motion of the motor vibrates the upper deck freely and no vibration to the ground floor. The sorting and grading of Teas are perfect on this machine and no re-processing is required. It requires less floor space and keeps floor clean. It upkeeps the appearence and the bloom of the Tea because of the minimum handling. It is 100% leak - proof and spillage free. It consumes less HP and requires minimum labour with higher output and thereby minimum cost of sorting. Interchangeability of Decks and screening meshes. No concrete foundation is required. Conveyorisation is simple and easy. Almost no sound - it is just Humming. Cleaning of all parts is simple and easy. With spare screens of various mesh sizes,quick changeover is possible to meet various grade requirements. Nos. of Decks can be provided as per requirements i.e. 3,5 & 7 Decks. Being very simple in design and of high technology standards with rigid constitution,no after sales service is required. Just on - the -switch and get the clean graded teas continuously. Inside of the machine 48"
No. of Decks-Normally preferred - 7 Decks. The manufacturer reserves the right to change the design of features of the unit for the improvement of the machine.